The temporary roof for the $2.7 million, 254 mph Bugatti Veyron Vitesse is actually an umbrella. 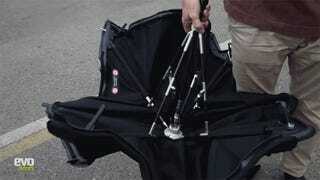 It is, though, a really sweet carbon fiber umbrella. Though the thing is rectangular and has regular fabric-roof clasps, it still has a handle and everything else that you expect from an umbrella. Here it is getting attached to the car. Check out that handle! You can see the umbrella roof in action in the clip from EVO below. Leave it to Bugatti to make a carbon fiber hyperumbrella. Or is that superumbrella?